Vietnam hopes Belgium’s Government and legislative bodies to accelerate the ratification of the European Union-Vietnam Free Trade Agreement (EVFTA), towards enhancing relations between the two nations, National Assembly (NA) Vice Chairman Uong Chu Luu told a Belgian legislator. At a meeting with President of the Chamber of Representatives Siegfred Bracke on June 28 during his ongoing working visit to Belgium and the EU, Luu expressed his joy at the comprehensive development of bilateral relations, and asserted Vietnam’s consistent policy of strengthening relations with Belgium. For his part, Siegfred Bracke said the two countries should expand cooperation, especially in culture, education, and training. He was interested in Vietnam’s efforts to promote economic reform and gender equality, and the work the country will do to implement the EVFTA. Greeting the Vietnamese official later on the day, President of the Senate Christine Defraigne showed her support for enhanced links between legislative bodies of the two nations and bilateral ties in general, in the future. NA Vice Chairman Luu spoke highly of meetings, visits, and coordination at international forums between the two countries, suggesting the parliaments speeding up cooperation at bilateral and multilateral forums such as the United Nations, the Asia – Europe Meeting (ASEM) and the ASEAN-EU cooperation mechanism, and working closely to deal with global issues. 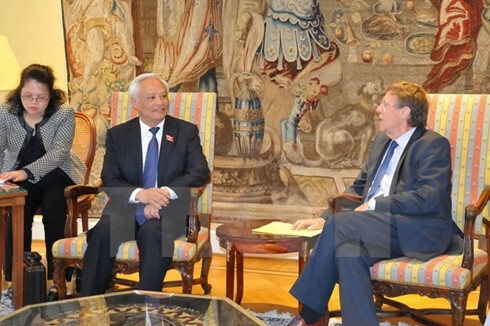 On the same day, the NA Vice Chairman also met European Parliament Vice President D imitrios Papadimoulis, during which the two officials discussed ways to step up the Vietnam-EU relations and the two sides’ legislative bodies in particular. Luu and his entourage had also working sessions with Chairman of the EP’s Delegation to Southeast Asia and ASEAN (DASE) Werner Langen , and Speaker of the Flanders regional parliament Jan Peumans.